ORACLE Racing Spithill placed second on the water in a testing race, but it was good enough to claim the overall lead in the America’s Cup World Series 2011-12 Season Championship with two events remaining on the schedule. “The good news is we took the overall lead. That’s the most important part,” said Australian Jimmy Spithill on taking over the series lead from Emirates Team New Zealand (Dean Barker). The final day of competition at ACWS Naples saw yet another variety of condition: light and lumpy. The wind on the racecourse peaked around 8 knots but at other times was non-existent, and with a lumpy sea running the AC45 catamarans were slamming on the sea due to the lack of power from the light winds. 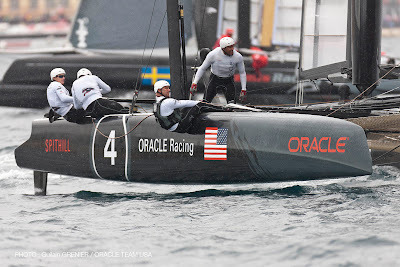 After a slow start, ORACLE Racing Spithill was in 8th place at the first reach mark and 6th through the first leeward gate. But by the 2nd leeward gate the quintet had climbed up to 2nd place, a position the sailors would hold to the finish of the 40-minute race. 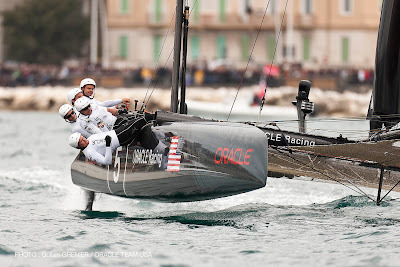 ORACLE Racing Spithill crossed the finish line 1:15 behind winner Luna Rossa Piranha (Chris Draper), which went on to win the ACWS Naples Overall Championship in the crew’s first regatta. The Luna Rossa Challenge 2013 was formed over the past winter after the conclusion of ACWS San Diego last November. Luna Rossa Piranha earned 50 points for the race win and finished with the high score of 92 points. 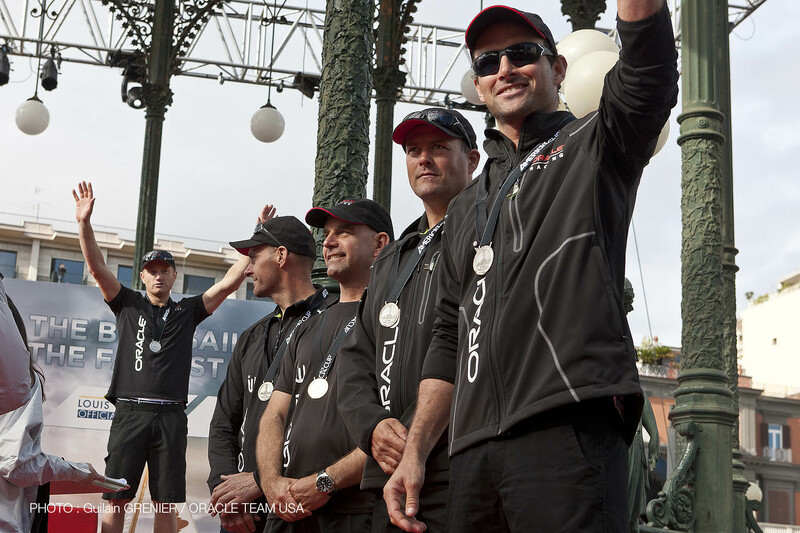 ORACLE Racing Spithill placed second with 77 points and Emirates Team New Zealand third with 60 points. By placing second in the fleet racing and seventh in the match racing, one place ahead of Emirates Team New Zealand, ORACLE Racing Spithill leapt into the overall lead in the ACWS 2011-12 season championship with two events remaining, Venice, May 15-20, Newport, June 26-July 1. ORACLE Racing Bundock placed 6th in the final fleet race and finished seventh overall in the regatta with 37 points. ORACLE Racing Bundock also placed third in the ACWS Naples Match Racing Championship after dropping its semifinal match against Luna Rossa Piranha. 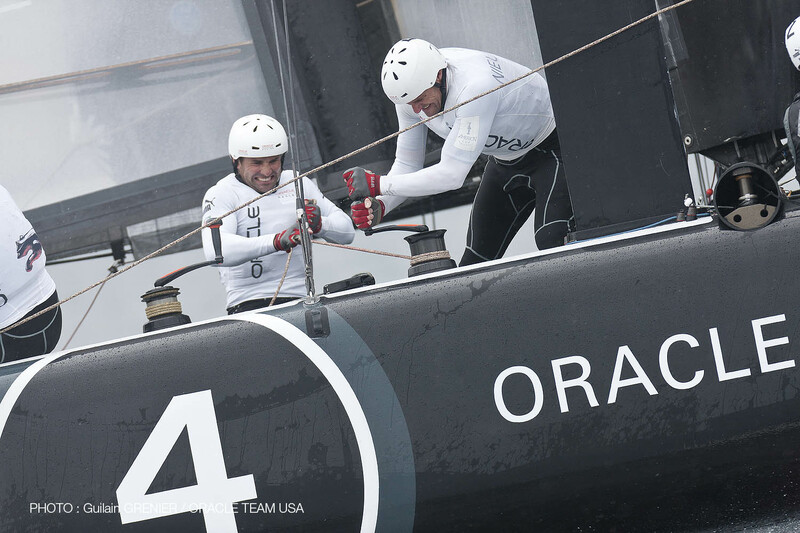 ORACLE Racing Bundock is apparently still the fastest AC45 on the water. The crew won the ACWS Naples 500 Meter Speed Trial today with the fastest time of 47.56 seconds at a top speed of 20.43 knots in winds between 7 and 10 knots. By comparison, ORACLE Racing Bundock won the San Diego speed trial last November with a time of 36.16 seconds at a top speed of 26.87 knots, the fastest ACWS speed trial ever recorded. The winds were blowing 16 to 20 knots that day.